I confess that summer is not my favorite season. No matter how much I love going to the beach, I don't enjoy being under the heat of the sun. Whenever we visit, I would rather enjoy the salty smell of the sea breeze under a beach hut and try avoiding the summer sun as much as I could. After all, spending extended hours under the extreme summer sun can pose serious dangers to our hair and scalp. It is the same UV rays that bring damage to our skin without proper protection can equally hurt your hair and scalp. Split-Ends - UV rays and extremely high temperature can take their toll on your strands. The heat drains the moisture of your hair out causing breakage. 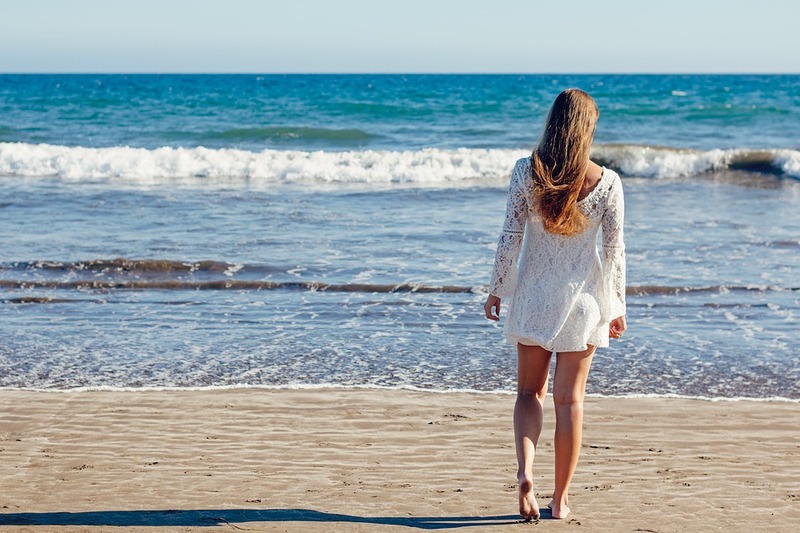 However for instances that we really can't avoid going out or for others who really loves the sun, salt and the sea, we don't need to worry because all these problems can be addressed by these simple hair care tips. 1. 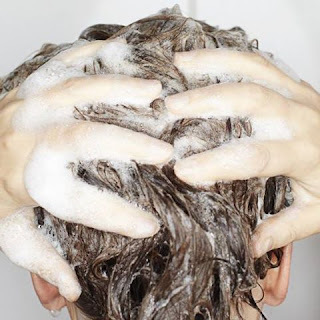 Keeping your hair clean and showered after each activity. 2. 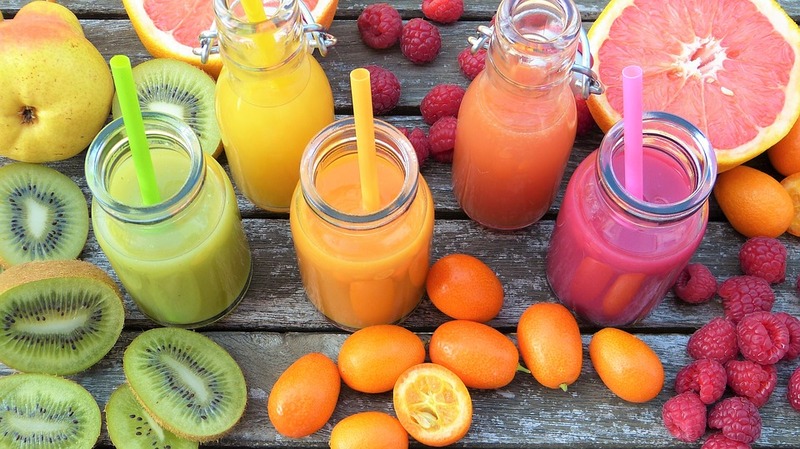 Take vitamin supplements or healthy food that are rich in Vitamin C and Biotin that benefit your hair. 3. Getting your hair pampered will also give respite to the sun and chemical abuse. 4. 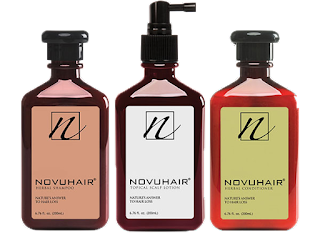 Use Novuhair - Nature’s answer to hair loss is composed of 19 Natural ingredients with some of the known medicinal plants such as Ginger, Pennywort and Ginseng blended with natural essences of rosemary and peppermint. 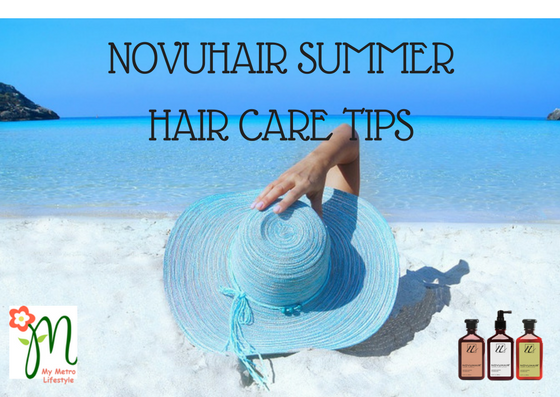 Novuhair nourishes the scalp and hair by increasing the flow of nutrients and improving blood circulation to the scalp which is very important after subjecting your hair from all your summer activities. Novuhair also helps hydrate the scalp, maintain the hair’s natural luster and prevent early hair graying, hair dryness and itching. #NovuhairSummer. Novuhair Topical Scalp Lotion, Shampoo, and Conditioner are available in all Mercury Drug Stores and other leading drug stores nationwide. For more information visit www.novuhair.com, like the brand’s official Facebook Page at Novuhair Official, follow it on Twitter and on Instagram. You may also call the Novuhair hotlines at 4136570 and 09228830575 and order online at Lazada. Having long hair during summer may not be the best idea. With the heat, sun, and humidity, one may just simply resort to immediately cut his or her hair short. However, for someone like me who does not want to really have short hair, these tips have been helpful on how to manage long hair this summer time. Please note that some tips are also applicable even if you have short hair. Since hair is all stressed due to the summer heat. We should try as much as we could to reduce its exposure to heat and thus, avoiding blow drying unless it is completely necessary. Summertime is the best time to simply air-dry your hair and go for the natural look. 2. Get as much protection. Yes, you read that right. We need to protect our hair by covering it using a hat or scarf which would also help you retain moisture for your hair. There are also some shampoos available in the market that offers UV protection or simply put a little sunscreen lotion. 3. Use wide tooth comb instead of a regular brush. Using a wide tooth comb is less harsh when you're untangling hair locks. Thereby, significantly reduces the stress we put on our crown of glory. 4. Put hair up in loose and comfortable styles using ponytails. Ponytail does a good job in keeping your hair under control while minimizing its exposure to the sun. Drawstring ponytail is my personal favorite because it makes styling so easy. How about you? 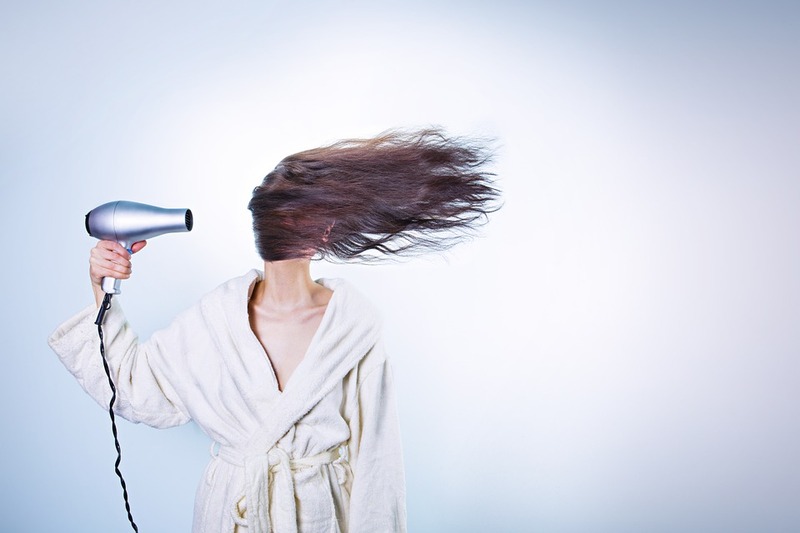 Can you share your personal summer hair care tips? #1 Amazon bestselling author and international speaker Teresa Gumap-as Dumadag is organizing a parenting event dubbed as Hands-On Parents while Earning or H.O.P.E. Summit on April 22, 2017. It will be from 8:30 AM to 5:30 PM at the Bulwagang Haribon, Insular Life Corporate Center, Alabang, Muntinlupa City. This whole day workshop on hands-on parenting and working smart in the new millennium seeks to inspire and teach parents how to marry hands-on parenting with earning for the family. Participants will be able to clarify their priorities and learn strategies and tips on how to live them out. Parents will be able to come up with a list of new habits that they can easily and consistently implement after the workshop so they can be more involved in their children’s lives. Parents will discover ways to work smarter so they can free up more time in their schedules to bond with their children. Parents will be inspired by the stories of the featured moms and dads (guest panelists) in the H.O.P.E. Summit and learn tips and strategies from them on how to be successful in their careers/businesses while being hands-on with their children. Parents will have an opportunity to meet and interact with other parents who also want to become hands-on parents while earning. Come out of the workshop more determined and committed to being a better parent. “It gave me the inspiration to become the parent that has freedom from corporate work while providing for our family through an entrepreneurial pursuit I am passionate about,” says Dennis Anguluan about the first H.O.P.E. Summit. “I am inviting you to attend this second run of the H.O.P.E. Summit this 2017. I can guarantee that this is a must-attend seminar,” says Jenina Tuazon, a breastfeeding mom, blogger and a participant of the first H.O.P.E. Summit. “I am sure this is really worth every penny of your investment,” Tuazon adds. The HO.P.E. Summit is co-presented by Full Life Cube Publishing and Events Services and Insular Life. The event is also supported by Payoneer, Kindermusik by Teacher Suzette and friends, Moringana by Organics Asia, Merry Macarons, Mom and Milly Educational Toys and KANSIS Made. Media partners include Experience of a super mommy, Lally’s Reflections, Mommy Bares All, Mommy Practicality, My Metro Lifestyle, My World by Mommy Anna, Roller Coaster Ride, Seminar Philippines, The Filipino Homeschooler, The Vine that Writes, Mums Daily PH and WhenInManila.com. The participants will receive giveaways from some of the event sponsors. They also have a chance to win exciting prizes in the raffle like books published by Shepherd’s Voice Publication. The first 20 participants will get customized Hands-On Parent while Earning bags courtesy of My Little Ikbi. Tickets to the H.O.P.E. Summit can be purchased at the Hands-On Parent while Earning online shop. Parents who want to attend can register via this link. For more details about this learning event, please visit the H.O.P.E. Summit Facebook events page at https://www.facebook.com/events/159412991221441/. 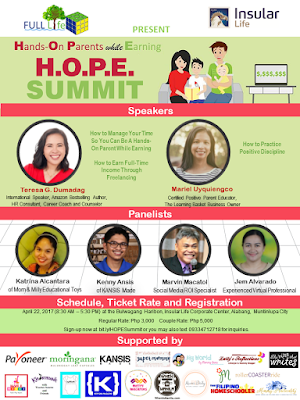 Plus, get the chance to win a free seat worth Php 3,000 to the HOPE Summit. The mechanics are very simple. 1. Make sure that you like Hands-On Parents while Earning on facebook. 2. Like and share this photo. 3. Post this in your status “I want to be a #HandsOnParentwhileEarning. Join me at the #HOPESummit2017 on April 22 in Alabang!” Make sure that your post is public. 4. Tag 4 friends (in your post) who are also parents and whom you think would benefit from the workshop. Tag Hands on Parents while Earning. 5. Comment your FB share URL in this thread. Winners will be announced in the Hands-On Parents While Earning's FB page. Mother's Day is a few months away but recent events made me realize how amazing moms are. A few weeks ago, my adopted furbaby, Cheesecake gave birth to 4 puppies. The delivery had some complications wherein the umbilical cord was not cut for 2 puppies and the last puppy got stuck for more than 12 hours. These made the puppies stressed and weak that they require extra care. Taking care of newborn puppies is no different taking care of a human baby. One must make sure they have a clean environment, no one gets sat on, gets enough milk and they never get cold. Plus, they have to be breastfed every 2 hours. The bottom line is - as a furparent to newborn puppies, I could not afford to sleep because I have to watch them closely no matter how tired I was. Just like moms - the responsibility is 24/7. No dayoffs or breaks. No matter how tired or sick they are. They have to attend to their children.This is the top reason why moms are simply the best. Their unconditional love for their babies (human or not) is so huge that they put their personal needs aside to attend to their family first. I realized that it is not easy being a mom. Moms give everything that they can to finish and fulfill their responsibilities. An 8-hour of sleep is indeed a luxury and one cannot afford to get sick. I even called my Mama and to ask her if it is really like this wherein I get no sleep. Plus, there are unending needs of your "babies" while household chores are piling up. I asked her how did she cope with everything. My mom just laughed and told yes, it's like that. Can you imagine life without mom? Watch this video and find out. Tag your moms/ wife below and let them how much you appreciate them. 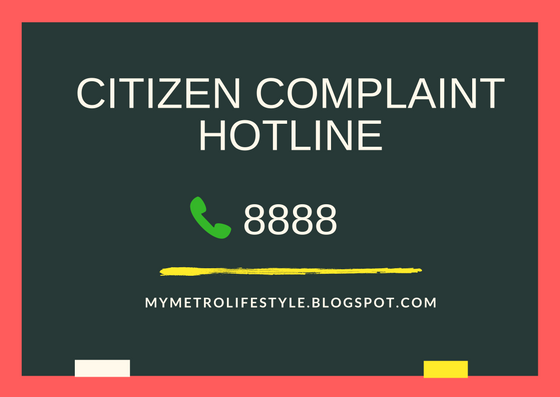 Is the Government Complaint Hotline 8888 really working? If you are wondering if our complaints against the government have finally stopped from falling on deaf ears, let me share with you a personal experience with the Citizen's Complaints Hotline. This is not the first time I had encountered problems with Philpost or the Philippine Postal Service. In 2015, a friend from the US sent me an audio CD. I paid Php 100 for "taxes" but was surprised that my parcel was actually empty. My friend told me that she is 100% sure that she was able to send them but it has simply gone into thin air just like magic. I tried to raise my concern but they said they could not answer me. Early last year, I signed up but with Procter and Gamble's Everyday Me program - a sampling site for the latest P&G products. I was lucky to get some samples but most of the time the samples that they send do not reach me, I contacted customer support and was told that it was shipped via our local post office and we can simply get in touch with them to follow-up. I called my local post office and said they would check. Tried this multiple times but I just got tired and never got them. I simply gave up. Then, last July 22. AIP sent me GCs as a reward for participating in their surveys and to my dismay. It was not delivered to me again. It was sent last July 22 and should be delivered in 1-2 weeks. After the second week of waiting, I called our local post office and asked for the status. I provided them my reference number (since this is a registered mail) but they said they have no record of it. I was advised to call again when the delivery man is in the office to check the status only to be told that they do not have a record of it. I was advised to call back again after a few days to check if this mail has been forwarded to them. After multiple calls (more than 20), I was informed that nothing was forwarded to them and I need to check with the sender or the post office where the mail was sent. Since my mail was from Cebu and it would be really hard to follow-up with them, I decided to ask help from Hotline 8888. 10.03.16 - I sent an email to Contact Center ng Bayan asking for their help. 10.04.16 - They acknowledged my email and gave me a reference number. 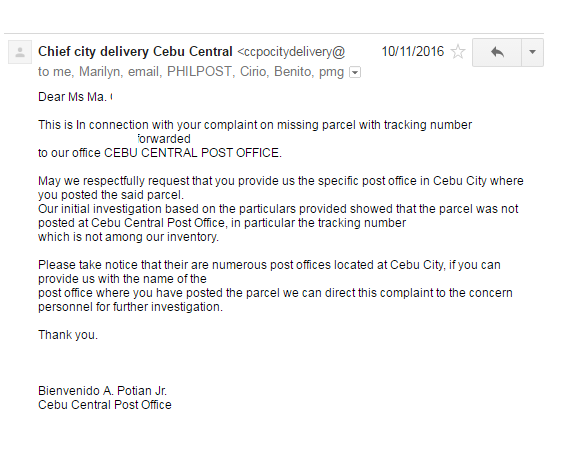 11.10.16 - I received an email from the Cebu Central Post Office asking for more details about my complaint. I had a series of email exchanges with Cebu PO. I was informed that my concern will be forwarded to a different post office in Cebu where my mail was processed. Honestly, by this time, I have lost interest in my missing parcel. It was not really that valuable that I can just let it go. Though inside of me, I feel that it is our right to have decent postal service in the country. With the rising age of e-commerce, it is about time that we have a reliable and trusted postal service from the government. 12.29.16 - I was surprised to get an email with a very long attachment. As you can see, it has been 3 months since I sent my initial complaint. I thought they have forgotten about my complaint or my concern was never forwarded to the other post office. 11.14.16 - This is the last day of my email exchange with the Cebu Central Post Office and Mr. Potian immediately sent a letter to Mandaue Central Post Office regarding my concern and sent them all the information that I have provided to them. 11.17.16 - Mandaue PO sent an email that this has been forwarded to Bacolod PO and they provided waybill number and other proof that it was indeed forwarded to my local post office. 11.29.16 - Civil Service Commission wrote to the Acting Postal Area Director regarding my complaint to follow-up and to ask them to act on this matter and requesting for feedback in 5 days after receipt. 12.01.16 - A report to the Department Manager for Central and Eastern Visayas regarding my complaint including the results of their investigation was submitted. 12.28.16 - A certification was issued about the status of my lost mail which I can use once I go to Bacolod PO. I need this because for the longest time they have been telling me that no mail reached them. 12.29.16 - I receive all these updates about my complaint. It may take a lot of time to get a resolution but I am glad someone is acting on these complaints no matter how small or big it is. After a few days, I was notified by the sender that they got a returned mail and that they would resend my missing mail. Coincidence? I do not think so. I think they have to do something about my missing mail because finally, the government has stopped being blind and deaf on all of these inefficiencies and complaints from ordinary citizens. These irregularities are no longer tolerated and it is about time that we are all treated as first-class Filipinos. So, if you think you have issues or suggestions, don't hesitate to contact hotline 8888. They are very helpful and they are really working.